An earthquake of magnitude 7.2 struck off Papua New Guinea on Thursday, the US Geological Survey reported. This is just two days after a 7.4-magnitude jolt shook the southern coast. 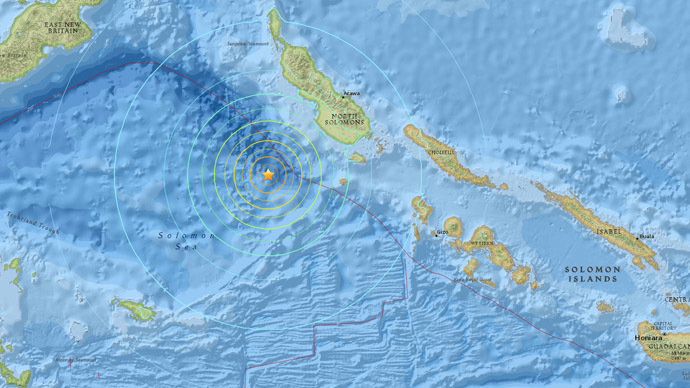 The quake, which struck 150km southwest of the town of Arawa, appears to be relatively shallow. There have been no immediate reports of damage or casualties, Reuters says. A tsunami alert has been issued by the Pacific Tsunami Warning Centre for islands in the region. "Hazardous tsunami waves from this earthquake are possible within 300km of the epicenter along the coasts of Solomon Islands and Papua New Guinea," the agency has warned. It's the latest in a series of strong tremors to hit the region in recent days. Papua New Guinea sits on the Pacific Ring of Fire, the point of collision of several tectonic plates. There are a number of active volcanoes and earthquakes are common.